Now, I'm going to share about other eyelash fix from Koji. 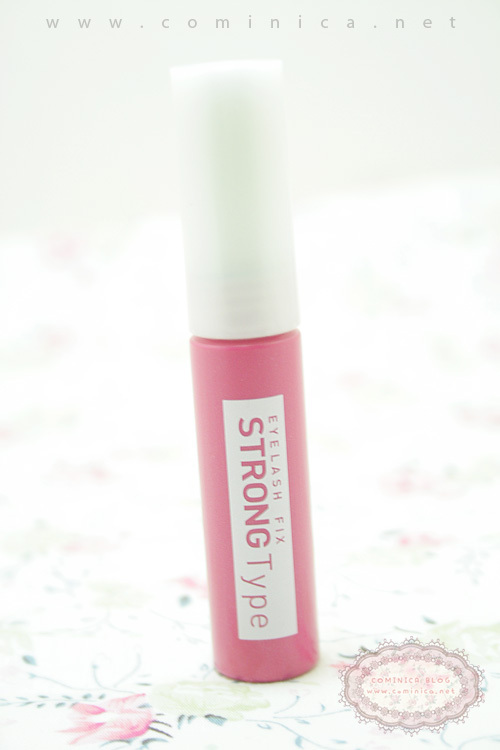 It is the same brand producer like Dolly wink, I'm curious about the quality because they claimed it to be 'Strong-Type' so it must work better right? Strong adhesive! It claimed to be a really strong eyelash glue but can easily remove from eyelashes. You know, sometimes other eyelashes glue brand usually come in clear liquid and it is hard to remove from false lashes. 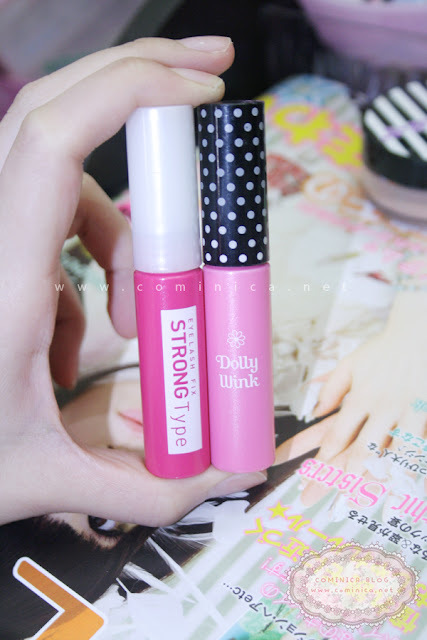 That kind of eyelash glue make our false lashes easily broken and ugly shaped. If we use China cheap false lashes that's fine because the eyelashes are cheap quality and not expensive. So in 2-3 times use it already broken and the feather usually look ugly. If we wear Japanese false lashes with good quality, we should use good quality eyelash fix too. Because it is safe and doesn't make the false lashes broken. Japanese eyelash fix usually easy to remove from false lashes so we can use it many many times. I can wear my Dolly wink false lashes more than 20 times, just don't forget to clean!!! What else I like from this kind of eyelash fix? The applicator! Usually comes with wand and small brush applicator so it is easier to apply to false lashes and touch up! I want to make sure how it smell and just like what I expected, it smell exactly like Dolly wink eyelash fix. It is super strong to stay on your eyes, because when dry the texture is like a rubber (acrylic resin) and can follow the movement of our eyes so it will feel comfortable. BUT, slightly stickier than Dolly wink sooo, be careful when remove the glue. It can stay against sweat and water too, but if you're sweating like crazy it can loose a little. Usually on the corner of our eyes. The formula is suit sensitive eye too, it is safe to use and of course easy to remove from eyes with water. Yeahh! Haha and it's cheaper than Dolly wink too. Give it a try! It's an amaizing review. I am22 years old, with swedes blood and have those short, thin, straight downward type of lashes. I got xlash eyelash serum from this website http://www.xlash.net/. I love it! I was a critic at first, I have tried everything else, So why not this serm? My lashes are longer, thicker and it has only been a week. After using xlash, I stopped clumping up my mascara and just used this. It makes your lashes shiny, lite, and cleaner than a mascara. My husband loves it! I do too :) I would highly suggest it. I am ordering more as soon as I am done with the first!